Brown sauce tops bacon butty poll. This entry was posted in Atkins, Breakfast, Depression, Diet & Weight Loss Diary, Diet Information, Dinner, fat, Low Carb, Low Carb Recipe, Low Fat, Lunch, weight loss and tagged Atkins, diet, healthy-living, lifestyle change, lose weight, Recovering Fataholic on March 5, 2015 by mariochappell. 24 Hour Non-Stop Eatathon. Hey! This Is For Charity! I’m willing to be a partner to somebody who wants to sponsor a fish eating contest. I just had mackerel for breakfast, tuna salad for lunch and poached cod and veg for tea. Who said this diet was hard work? And the bonus is that it is good for depression too! This entry was posted in Atkins, Breakfast, Depression, Diet & Weight Loss Diary, Diet Information, Dinner, fat, Low Carb, Low Carb Recipe, Low Fat, Lunch, weight loss and tagged Atkins, depression, diet, Fish, healthy-living, lifestyle change, lose weight, low carb, low carb diet diary, low carb recipe, low fat, Recovering Fataholic, weight loss on December 23, 2014 by mariochappell. Hello blogosphere people. I’m going through an odd period of weight loss and weight gain which I am struggling to understand to be honest. I have bounced around 104kg. 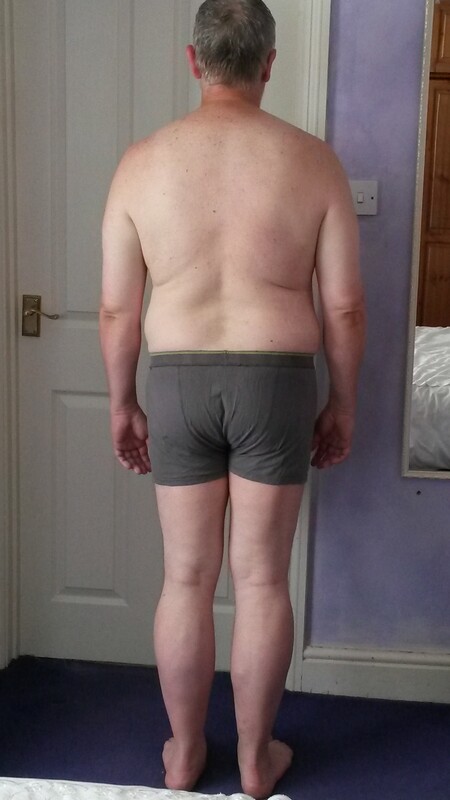 Having been as low as 103kg and as high as 105kg. I’ve been running (or trundling) and feeling okay? Check. I’ve been keeping up with my press-ups, sit-ups? Check. I’ve been following my regime of eating little or no carbs? Ahhh, here’s the thing! I have been working away from home, not just in an office but up at odd hours, travelling long and short distances, working on sites for 3 or 4 hours at a time, then the long drive home. I have been eating things which to you might seem healthy; but to me are really hard to digest. Take melon for example, to you melon might seem like a healthy option, something you choose when you are trying to lose weight right? So what about if within the hour you consume some brazil or almond nuts? Another healthy option you might think. But the combination of sugar with fat is dietary suicide to anybody like me. The carbs alone are killing me. On the other hand — I feel tired, angry, irritable, aggression, cravings etc when I get up at 3am and put a dessert spoon of coffee into a travelling mug, add lots of milk to cut the bitterness then top it up with a heaped spoon of sugar to boost my energy level. Soon afterwards I hit a craving for anything sweet. So do I choose another sugary coffee or chocolate? I totally understand why people get fat. I see it clearly and I can also see that a lot of companies are making a lot of money trying to keep me fat. Cadbury’s doesn’t care how my liver is. It stocks the shelves with chocolate because they pay the most for the space. The guy who sells fruit and veg is cast to the back of the shelving display, almost as an afterthought. Why is it I can select from over 100 different types of chocolate confectionery in a garage and only get an option of banana or apple or a tiny pack of melons as fruit options? I will return to having fish, meat, eggs and veg for breakfast, lunch and dinner. I will have the occasional treat of nuts or plain yoghurt and maybe a piece of fruit a couple of times a week. I have to get this belly down to an acceptable size and it won’t move itself! Besides — I feel healthy when I eat just meat, fish and eggs and veg. This entry was posted in Atkins, Depression, Diet & Weight Loss Diary, Diet Information, Low Carb, Low Fat, weight loss and tagged depression, diet, Fish, health, healthy-living, lifestyle change, lose weight, low carb, low fat, Recovering Fataholic, weight loss on September 21, 2014 by mariochappell. Diary of a Recovering Fataholic. August 2014. Feeling Great. When I began my journey shortly after the “witch doctor” forced me to “eat better or die” I had moments when I wasn’t altogether sure it was worth it. Okay the fitness was lower and the self-esteem was being pummeled by the mirror on a daily basis but over the whole of the next two years since 2012 I have had lots of highs and lots of lows. But today I was stopped in my tracks by a lovely lady I know as a client of mine. I was visiting the open plan office where she works and she sits with a colleague I also know well. Anyway, I was visiting somebody else onsite and the job required me to wear their polo shirt so I was wearing their brand. Thing was they gave me an XL shirt, not the normal XXXL I used to wear or the XXL I am down to now. I needed to visit the toilet to change and thought nothing of it. Having returned to the client and showing amazement that I actually fitted into the shirt they offered me. Anyway after receiving the job brief I headed out of the door and was stopped in my tracks by this lady who was stunned by the change in my appearance. Her genuine warmth and curiosity about how I had physically changed so dramatically, to her mind, was incredibly touching and lifted my emotions enormously. I explained that it was mostly down to switching to fish. She thought this idea was brilliant as she liked fish and would give it a go. I hope she does and mentioned how I buy in bulk to get discounts and shop when there are offers on as well, all of which she took note of. Only the rich can afford to eat fish at RRP! I was really happy when I walked away from her. Thanks lovely lady for making me feel brilliant, and you don’t even know you’ve done it. This entry was posted in Atkins, Breakfast, Diet & Weight Loss Diary, Diet Information, Dinner, fat, Low Carb, Low Carb Recipe, Low Fat, Lunch, weight loss and tagged Atkins, diet, diet low fat cirrhosis, Fish, health, healthy-living, lifestyle change, lose weight, low carb, low carb diet diary, low carb recipe, low fat, Recovering Fataholic, weight loss on September 1, 2014 by mariochappell. I got fat slowly, if my memory serves me right. An extra piece of pizza here, a pause in the chair too long there and pound by pound the fat cells ballooned and multiplied. You have to eat more than you burn to gain weight, unless of course we’re talking weight lifting, and we’re not; it’s all fatty this and fatty that. I failed to fix it and that’s my fault. But whilst I was getting fat I was also busy working both ends of that candle and building my life so if I look back it’s got to be with a mixture of emotions. The journey up (in weight) was slow and inevitable considering my path. As I slowly approach 50 I want to ensure the journey down is just as slow. I have been taking photos along the way…. 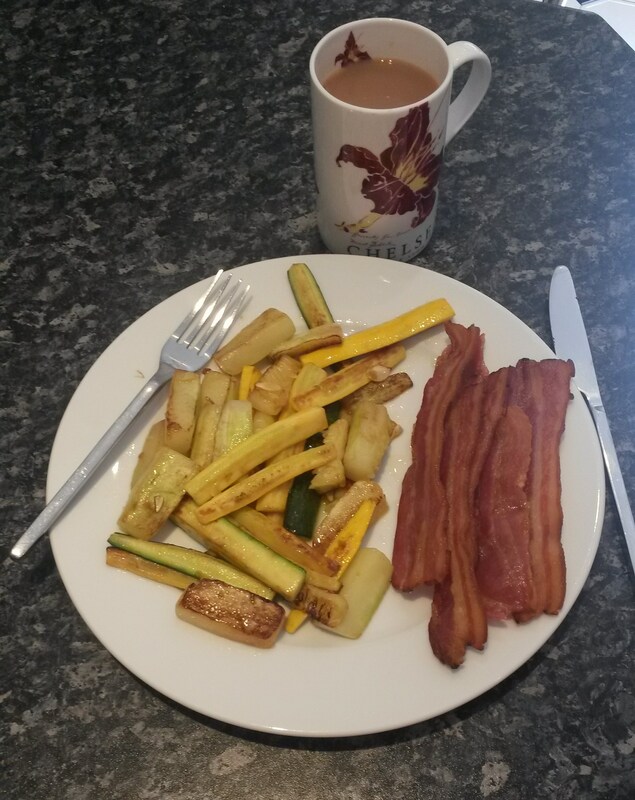 like this one showing a recent low carb breakfast of bacon and courgettes (zucchini). The yellow courgettes/zucchini were grown in our garden by my wife and tasted very sweet and fresh. I cooked this breakfast using my new atomiser where you fill this plastic bottle with olive oil and pump the cap a few times. Then as you release the oil it atomises under pressure. Simple, ingenious and a fifth of the oil I was using previously. Believe it or not the glisten on the courgettes (zucchini) is a mixture of oil and water from my new “steam frying” cooking method. My weight loss has slowed right down again this month but with food like this for breakfast it isn’t hard to cope. In fact this diet is unbelievably easy. Eating low carb is just about cutting out the bad stuff anyway. Processed foods like cheese may be the reason why your version of low carb is different to mine. I see a lot of low carb recipes that contain cheese in one form or another. But I know from having punched in the data that consistent high fat food with low carbs is the wrong path for me. I have to use low carb AND low fat combined. And this is where I start making sense to myself. The reverse is exactly how I got fat in the first place so the epiphany has to be that putting the combination that made me fat (sugar and fat together) in reverse is inevitably going to reverse the process. So I am now recording carbs and fat in my FatSecret app and also recording my exercise. As long as I record a net imbalance of at least an average of -600 calories down per day across a 7-day period then I am satisfied. I think you can see that there is a definite difference. I still have creases that must be removed but the jogging, sit-ups and press-ups and climbing up and down my stairs lots of times is helping me keep my stamina up. Slowly – is how I got to that one on the left. So slowly is how I plan to get to a normal weight. Also look at the way my legs are more underneath me on the right. This weight loss has helped with better posture too. That’s gotta be good for my overall health. Sorry about the underwear. I needed to keep them the same for the record. I use Facebook to find old friends and one such person is also a champion of health and fitness. The bloke is mad for running and whilst on the one hand makes me wildly jealous of his fantastic physical shape, he has also inspired me to get fitter and faster. I was just walking on the treadmill to begin with but since finding him and seeing his antics I began to think even an old git like me could regain some sense of normality – if only I got a bit faster. So I did. This entry was posted in Breakfast, Diet & Weight Loss Diary, Diet Information, fat, Low Carb, Low Carb Recipe, Low Fat, weight loss and tagged Atkins, diet, healthy-living, lifestyle change, lose weight, low carb, low carb diet diary, low carb recipe, low fat, Recovering Fataholic, weight loss on July 27, 2014 by mariochappell. We it’s only 6:30pm but I can’t see me eating much more today. I am stuffed. I might add some brazil nuts later but I doubt it. Whether you are trying to lose weight or lose fat or just eat low carb food in order to get a healthier liver, like I do, whatever your reason I honestly believe you can do worse than find your inspiration on WordPress. Hope you lose some too. Or if you can’t be bothered with all of that – just like and follow my blog already! Good luck to you. This entry was posted in Breakfast, Diet & Weight Loss Diary, Diet Information, Dinner, Low Carb, Low Carb Recipe, Low Fat, Lunch, weight loss and tagged diet, health, healthy-living, lifestyle change, lose weight, low carb, low carb diet diary, low carb recipe, low fat, Recovering Fataholic, weight loss on June 29, 2014 by mariochappell. What a few weeks it has been. My weight loss has slowed right down but not paused. That’s great news for my motivation. To be honest – breaking 106kg was quite a big deal in effort and concentration after the joy of being told by the doctor that I had returned to normal. And all this through low carb eating and simple walking on a treadmill. I was eating low carb but burning the fat at the same time. Losing weight for me is a consequence, not the focus. Perhaps that’s why I am successful at losing weight. I simply don’t try losing weight, I just pay attention to my diet regime and the weight slips off sort of accidentally. What totally threw me was a sudden urge to run. Well jog. Well move my bottom at a pace which to me resembled life or death but to a passing motorist would only present as mildly agitated walk but from my angle was a possible heart attack in progress. So I encouraged my boy to come for a run and after a personal best on the treadmill of 200m at 4kph I felt invincible and donned a pair of rugby shorts not seen on my legs since the middle of 1999. Next I slipped on a pair of cheap Tesco trainers I bought for a £10er and we were off. Then there was the hill. My boy was encouraging me and got me to a new personal best of 600m. So we did a little “dance of joy” as my Big Sis calls it and then came the heavy realisation I still had to get back home. I might have to rethink this running business. This entry was posted in Diet & Weight Loss Diary, Diet Information, fat, Low Carb, weight loss and tagged healthy-living, lifestyle change, lose weight, low carb, low carb diet diary, low fat, weight loss on June 23, 2014 by mariochappell.